On this day, August 29, Edmond Hoyle died at the age of 97. It is said that imitation is the sincerest form of flattery and Hoyle had countless imitators. But to me, nothing flatters more than satire—it requires familiarity with and affection for the target. Most of all, effective satire demands a target larger than life. Thus, I choose to commemorate the life of Hoyle with a discussion of a contemporary satire of Hoyle, his book, and the passion for gaming that makes both immortal. Hoyle published A Short Treatise on Whist in November 1742 and sold it privately to his students. The first commercial edition to reach a wider audience was a piracy, published in mid-February 1743, followed by an authorized "second" edition in March 1743. I discuss the details of the piracy and the efforts to combat the pirates in my article "Pirates, Autographs, and a Bankruptcy: A Short Treatise on the Game of Whist by Edmond Hoyle, Gentleman." It was originally published in Script & Print, 34 no. 3 (2010): 133-61 and is available for download here. In early May 1743, the anonymous play The Humours of Whist (freely available for download here) was published, obviously satirizing Hoyle and the contemporary mania for gaming. Less obviously, the play satirizes the battle between the pirates and the publisher. I'll focus on a few of the aspects of the play that satirize Hoyle and will discuss those that touch on the publication history in a future essay. The long title of the play is The Humours of Whist. A Dramatic Satire, as Acted every Day at White's and other Coffee-Houses and Assemblies. The play was never performed—but all the behavior being satirized must have been evident every day at the coffee houses where gaming took place. In the play, Professor Whiston is Hoyle and, like Hoyle, is a whist tutor who has just written a treatise on the game. The comic hero is Sir Calculation Puzzle, "a passionate admirer of whist, who imagines himself a good player, yet always loses." (p8) Lord Slim, a student of Whiston's, asks Puzzle, "How do you like the last edition of his treatise with the appendix, Sir Calculation? I mean that sign'd with his name." (p15) Here, Slim shows awareness of Hoyle's autograph used to distinguish the genuine editions from the piracies. In the midst of a discussion about the value of whist to society, Lord Rally notes "And I fancy too with ace, king, and four trumps, I should be able to fetch the trumps out, tho' you asserted ever so roundly the contrary." The professor replies "Your Lordship has laid your finger on the only errata in my book." There is no shortage of amusing passages to discuss. In the historical discussion in his 10th edition of his Laws and Principles on Whist, Cavendish chooses some of the same ones as I did, including others as well. 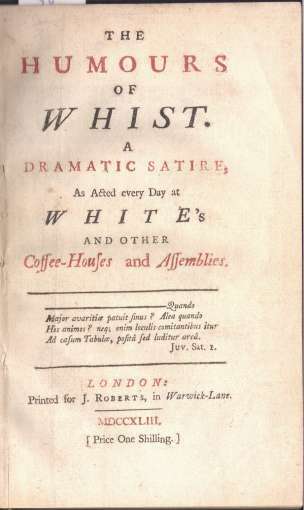 The point is, I think, that the readers of The Humours of Whist must have been intimately familiar with Hoyle's Whist to appreciate the satire, and the anonymous writer even more so to create it. Long live Edmond Hoyle (1672-1769)!